Luisa Tetrazzini (1871-1941), called “The Florentine Nightingale,” was a world renowned opera star who was a favorite of San Francisco audiences. Chefs often named dishes for prestigious clients at their restaurants. But just what chef she inspired remains in doubt. One theory has the chef at the Knickerbocker Hotel in New York City, Mr. Pavani, creating the dish to honor Luisa Tetrazzini’s January 1908 New York debut singing Violetta in La Traviata. It is likely she stayed at the Knickerbocker at Broadway and 42nd Street; many opera singers in that period did, and in fact Enrico Caruso became a resident, moving his family there to be near the Metropolitan Opera. Although the Knickbocker no longer exists, one can still find a locked door at the Times Square subway station platform with the name Knickerbocker above it, where at one time a stairway led from the subway up to the lobby of the hotel. A few historians claim that master French chef George Auguste Escoffier invented Chicken Tetrazzini, but it is not mentioned in his cookbooks. Some sources say that a recipe for Chicken Tetrazzini appears in the Christian Science Monitor in October 1908, and in the Chicago Tribune in 1911. Various other people claim their relatives invented it at the turn of the 20th century. Supporting San Francisco’s claim to the recipe is James Beard, who believes that the dish was created at the Palace by Chef Ernest Arbogast. Arbogast, who retired after twenty years of service at the Palace, is also know for creating Oysters Kirkpatrick... oysters dipped in a sauce of ketchup and butter, covered with bacon, topped with Parmesan cheese, and baked. That 1900 invention is named in honor of hotel manager Colonel John Kirkpatrick. It is possible he created Chicken Tetrazzini in 1904 when Tetrazzini sang to great acclaim in San Francisco and was featured in daily articles in the San Francisco Chronicle. Or maybe Arbogast gave the dish its official name after the 1908 New York debut when Tetrazzini had a second triumph in San Francisco. Another possibility is that the dish was premiered after Tetrazzini gave her famous outdoor Christmas Eve concert in 1910 before an estimated quarter of a million people at Lotta’s Fountain. That concert came about when two New York impresarios began feuding over which controlled her New York opera contract. When they attempted to get an injunction to prevent her singing in any theater until their legal squabble was settled, Tetrazzini, who loved the worshipful audiences in San Francisco, headed to the City vowing to sing in the streets if she had to. Although no injunction was issued, she carried out her promise with the open air concert that has become legendary. Cook spaghetti according to package directions. In a large skillet, add olive oil, and heat over medium heat, add onions, salt and pepper. Cook onions until tender. Add cream of chicken soup, cream of mushroom soup and chicken. Mix well. Once spaghetti cooked, drain well. Add spaghetti to chicken and mix well. Spray 13x9 baking pan with nonstick cooking spray. Add chicken and noodles to baking pan. Sprinkle with Mozzarella cheese. Preheat oven to 350 degrees. Cook about 15 to 20, until cheese has melted and bubbly. Enjoy! Nice quick recipe here. One time I made turkey tetrazzini, but it was a lot more involved and I made way too much! Have yet to make it since, but I may try your chicken recipe here. Love the history!! Such a nice treat to read where food orginated from. My bf is OBSESSSED with chicken tetrazini. His mom refuses to give me the "correct" recipe so it never taste good. Know that you shared yours he may like a new favorite! Hi Umm Mymoonah, welcome! We are happy to have you here. Hi Amy and Tiffanie, I think he will like this dish. 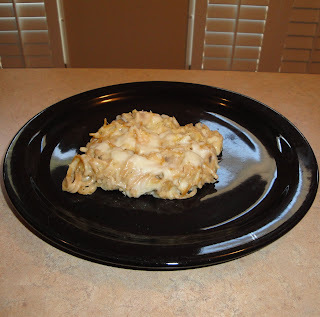 Mmm I LOVE chicken tetrazzini and that's so great how you shared the history behind it :) Fabulous recipe! Often wondered where that name comes from, thanks for sharing. I had no idea how the dish got it's name...great history! Sounds good- I love the history behind it!! if made for a pot luck, it would be gone in a minute. I will definitely make this ! This is new to me but am certainly in for trying new type of food and recipes, more over, with the cheese added, certainly cannot resist it. Mm, this looks yummy. Have not had this in ages. Thanks for sharing another great recipe. Sounds yummy, thanks for the recipe. Hi Toyin O, thank you! Hi Christine, thanks for stopping by my blog! What interesting information about the history of tetrazzini! Hi Heather, thanks for stopping by.